The Hop Garden will be conducting a workshop on growing Hops. 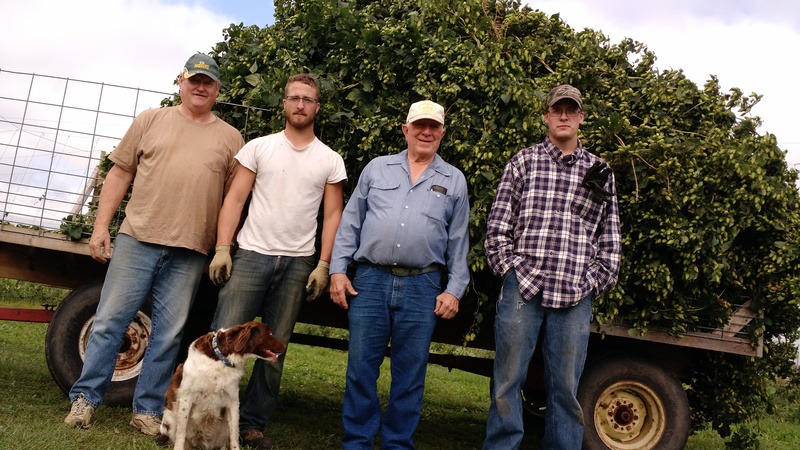 Our 7.5 acre Hop Yard is 5 miles south of Belleville, Wisconsin. We are located about 20 minutes south of the Beltline from Madison. Where best to learn about hops than an actual 7.5 acre hop yard! Workshops will be led by Rich Joseph, Owner of The Hop Garden. The Hop Garden also brews beer using its own hops and sells to over 100 retail outlets in Southern Wisconsin. The Commercial Hop Growing Workshop is designed for the group that is thinking about growing a larger amount of hops from ¼ acre which is about 250 plants to 10 acres or more. Topics will include, Hop plant structure and life, what Brewers are looking for in their hops, economics, labor requirements, hop yard planning and design, purchasing rootstock and plants, scouting for weeds and insects, harvesting options, dryer or oast design, resources available, packaging and marketing or working with Wisconsin Hop Exchange Cooperative. Cost is $45 per person or $35 per person if signing up in a group of two or more. Thumb drives with all information presented and more will be available for an additional $15.00 The Workshop will start at 9:30am and will finish at Noon with Hop Garden Beer Tasting and Farm Tour. This workshop will be offered on March 18th 2017. Make a day or a weekend of it and visit local breweries. We are 8 miles from New Glarus Brewing, 10 miles from Wisconsin Brewing Company and Hop Haus in Verona, 12 miles from The Great Dane in Fitchburg, 17 miles to the Grumpy Troll in Mt. Horeb and 25 miles to Minhas Brewing in Monroe. There are excellent Hotels in all of these cities. Rich Joseph: 608-516-9649, rich.joseph.rj or visit our website: TheHopGarden.net visit us on Facebook – The Hop Garden, Belleville, WI.